Paris, Tuesday 22 November 2011, press release. During the 2011 Éducatec-Éducatice education forum1, the French education inspectors in charge of new technologies, who act as advisors to the regional Education Ministry representatives ["inspecteurs d'académie"] will have their annual meeting. This year, the central administration of the Education Ministry directly convened them at the headquarters of Microsoft in Issy-les-Moulineaux. April and Framasoft deeply regret that Free Software and Free resources are left aside from the entire program of these days. Over a hundred of such inspectors in charge of new technologies are invited at a meeting dedicated on Microsoft's technologies at Microsoft's headquarters on Tuesday 22nd, eve of the beginning of the forum2. The events will continue on until November 24 at the Porte de Versailles exhibition centre, following a pre-established program that appears to focus mainly on proprietary technologies. Like many teachers, we believe that having these inspectors convened at Microsoft's headquarters is a blatant breach of the neutrality required from the teaching system3. We believe this to be incompatible with the missions and the values of the teaching institution and of the teachers. It is also contrary to their culture of diversity, of plurality, of sharing and appropriation of knowledge by all. "These inspectors are entitled to receive training that meets the academic neutrality and the technological pluralism. In 2011, it is difficult to ignore the many contributions that Free Software has brought to education" says Rémi Boulle, vice-president of April, in charge of the Education Working Group. According to the programme, a round-table will aim at identifying major trends and needs that are appearing in the realms of the educational uses and of digital resources. We hope that many references will be made to Free resources; and we also hope that the idea of encouraging the sharing under Free licenses and of preserving teaching from mercantile matters will be discussed. Let us underline that since long time the Free Software community is committed to the Ministry of Education and alongside teachers towards equal opportunities, the right to access the latest technologies and the reduction of the digital divide. These solutions are long-lived and have a wide base of users in French schools. Free Software provide quality alternatives at a lesser cost, while maintaining technological pluralism. Moreover, it promotes local employment. Let us not that the Ministry itself provides teachers with the SIALLE service4, a source of information on the educational Free Software that is available. The Ministry is also involved in the national project EOLE5. Finally, a framework agreement6 was signed by the Ministry of Education for the use of Free software and resources in the area of education. Still, their importance continues to be minimized by some players. In the interest of teachers and students, it would have been essential that the program of this course include at least a dedicated slot for Free software and resources. It is even less understandable that the forum puts forward the Sankoré program (an international ecosystem, both public and private, that produces Free digital educational resources) that concerns primary teachers. We are at the inspectors disposal for any further information on Free software and resources for education, and we wish them an interesting Éducatec-Éducatice forum. 3. 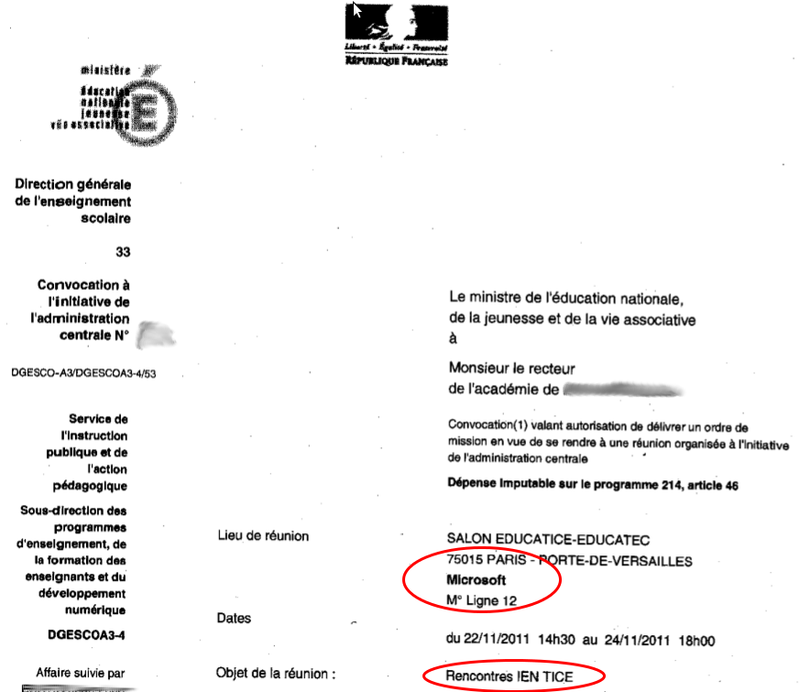 On this same theme, you may read  with interest the "Code of good conduct for companies intervening within schools"
6. http://eduscol.education.fr/data/fiches/aful.htm  signed in 1998 between the Ministry and AFUL. It has been renewed since.